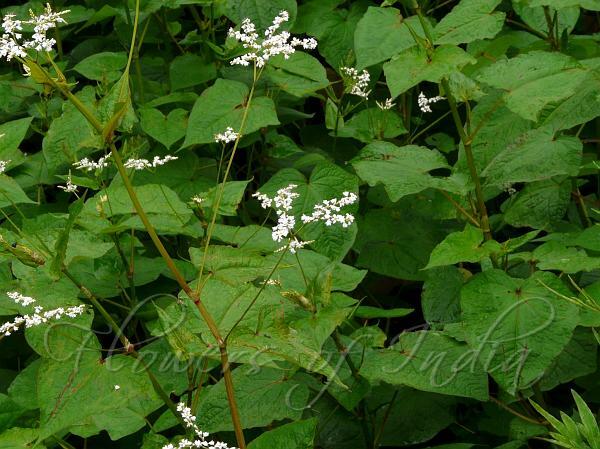 Perennial Buckwheat is a tall, perennial, sparsely velvety, branched herb. Leaves are carried on 1.5-7 cm long stalks - upper stalks are short and the lower ones long. Leaves are broadly triangular, arrow-shaped or heart-shaped, long-pointed, 7-10 x 2.5-7 cm. Ochreae are 0.8-1.2 cm long, brown, tubular, truncate, membranous. Flowers are borne one-sided on the long recurved branches of the inflorescence. Flowers are stalked, white. The stalk carrying the cluster, is 6-16 cm long. Tepals are 5, 2-3 mm long. Stamens are 8, alternating with glands. Ovary is 3-angled, styles 3. Nuts are 3-angled, angles acute, ovate, 6-8 mm long, about 5 mm broad with flat or concave surfaces. Perennial Buckwheat is found in the Himalayas, in Bhutan, Kashmir, Myanmar, Nepal, Sikkim and Vietnam, at altitudes of 1500-3400 m. Flowering: May-September. Medicinal uses: The whole plant is anodyne, anthelmintic, antiphlogistic, carminative, depurative and febrifuge. It stimulates blood circulation. A decoction is used in the treatment of traumatic injuries, lumbago, menstrual irregularities, purulent infections, snake and insect bites.